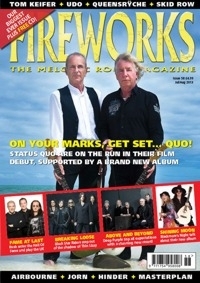 Issue 58 of the best melodic rock magazine on the market is due out now, and you don't want to miss it. The new Fireworks has got something none of our previous issue have. In fact, it's got sixteen things none of our previous issues have. For one issue only, we had so much good stuff we've added an extra SIXTEEN pages to the issue, making it our biggest issue ever. We've stuck a FREE CD on the front. And we've kept the price exactly the same. We do it because we care. The 112 page full colour glossy monster issue isn't filled up with just any old junk either. We have British rock legends Status Quo talking about their brand new double album and film 'Bula Quo', recently named 'Album Of The Week' on Radio 2. Another stalwart of the British scene, Deep Purple, tell all about their awesome new record 'Now What ?!' Former Deep Purple and Rainbow guitar hero Ritchie Blackmore is in talkative form about his work both past and present as he and his lovely wife Candice Night discuss the new Blackmore's Night record. Black Star Riders step out of Thin Lizzy's shadow with their debut album and they tell us all about it, while Rush explain what it's like to finally be inducted into the rock and Roll Hall of Fame. With able support from Cinderella's Tom Keifer, Skid Row, Hinder, Queensryche, Masterplan, Airbourne, UDO and Nils Lofgren just to mention a few of our THIRTY SIX interviews in total, we also have a huge section detailing all the album releases, reissues, DVDs, and books out at the moment. If you tell us there is better value for just under a fiver, we'll call you a liar. Fireworks 58 is a must have. Use the Store Finder to find your nearest participating stockist, or simply order online from our shop!